Bids are built interactively by dragging inventory items onto the bid form. 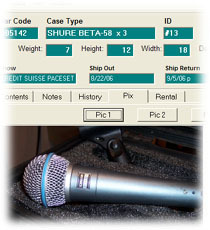 Pre-set rental prices are automatically inserted but can be overridden on a line by line basis. Click here to see a sample bid. Bids can be split into logical sections, each with its own discount and sub-total. Bids can be converted to invoices or exported to QuickBooks. 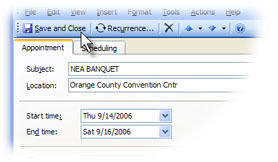 Instantly add any PackMan event to Outlook for personal reference or for company-wide sharing. All PackMan reports — purchase orders, bids, equipment lists, etc. — can be automatically converted to Acrobat PDF files and added to new outgoing email messages. Support for Brother P-touch label- makers allows you to print bar codes directly from PackMan. Any "grid" of data within PackMan can be exported easily to Microsoft Excel. 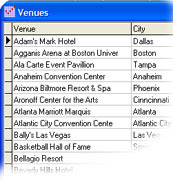 Choose from a pre-filled list of Venues and address, phone, contact, loading dock info are automatically associated with an event. Every inventory item can have a photo associated with it, and each case can have 4 photos. Great for front and back views of rack configurations.